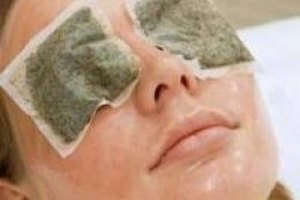 How to Treat Dark Circles With Slices of Cucumbers. The archetypical day spa customer is the one with the towel wrapped around her head and the cucumbers on her eyes. There's a reason for that: using slices of cucumbers is a very good way to treat dark circles under the eyes. The ingredients they contain help to lighten the skin, as well as to cool and soothe the eyes if they are red or swollen. 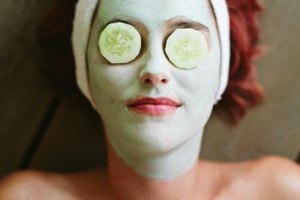 Of course, you don't need to go to a spa in order to treat dark circles with cucumbers. Rinse a fresh cucumber thoroughly to get off any attendant dirt and detritus. Place the cucumber on a cutting board and cut several thin slices off of it with a knife. 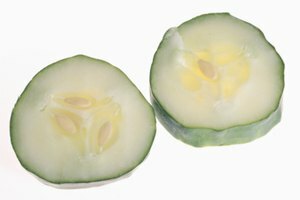 You generally want the slices to be as thin as can be while still remaining "whole"--the skin of the cucumber should be intact around the sides of each slice. If you're not used to cutting, this can take a little practice, but it becomes easy once you get the knack. Lie down on your back in a cool place with as little direct lighting as possible. The prone position makes it easier to balance the slices of cucumbers on your face, while the low light helps to treat the dark circles further. 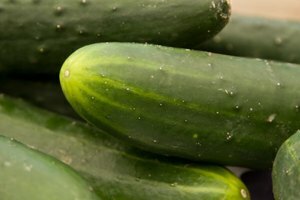 Avoid sunlight or harsh bright lights--they'll drain the moisture out of the cucumbers and may make the dark circles worse. Lay the slices of cucumbers over your eyes, making sure they touch the skin everywhere where the dark circles can be seen. You want their moisture and nutrients to soak into your skin around the dark circles. Leave the cucumbers in place for 5 to 10 minutes. You can use a timer or an alarm clock to do this, since you won't be able to open your eyes easily with the cucumbers on top of them. Repeat the process as necessary, using fresh cucumber slices as you do so. You can treat dark circles most effectively if you do it regularly on set days of the week and at a set time each day. The treatment will hydrate your skin, reduce puffiness and help eliminate the dark circles. Alternatively, slices of potato will work to treat dark circles. Though they don't have the same amount of vitamin C or other useful nutrients, they still work to hydrate and soothe the skin.